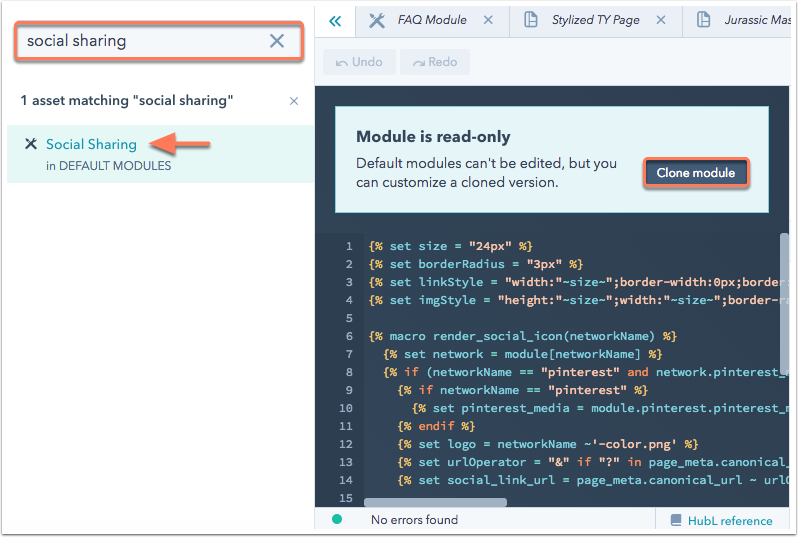 To use custom social icons in a Follow Me or Social Sharing module on a HubSpot page or template, create a custom version of the module to add your own social icons. In the upper left, use the search bar to locate the default Follow Me or Social Sharing module. Click the name of the module.to open it in the editor. In the alert in the module editor, click Clone module. In the dialog box, enter a name for your cloned module, then click Clone. In the module inspector, locate the Linked files section. Under Other files, take note of the social icon file names for each network (e.g. facebook-color.png). 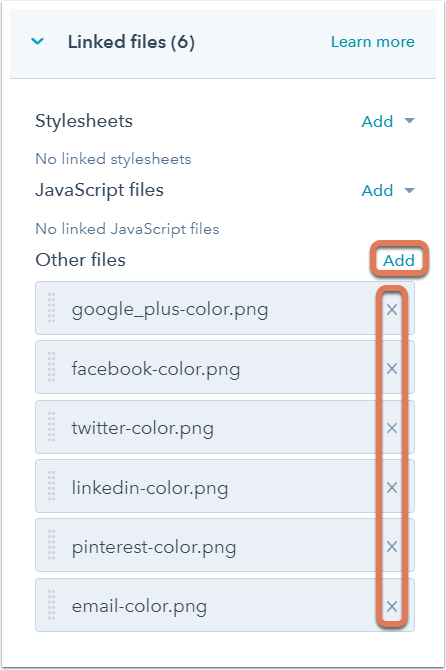 Ensure that your custom social icon images are in PNG format and have the same file names as the existing social icon files for each network in the module (e.g. facebook-color.png). To replace an existing social icon for a network, click the x symbol on the right of the file. Then, click Add next to Other files. In the right pane, use the search bar to locate your custom social icon in your file manager, or click Add file in the bottom left and select Upload files to upload your custom social icons from your device. Click the file name to add the icon to the module. After replacing the social icon file(s), click Preview in the upper right of the module editor to open a preview of the module. When you're satisfied with how the module appears, click Publish changes in the upper right of the module editor. You can now add this new custom module to your HubSpot content.